Biwako Otsu Tourist Ambassadors in yukata. Here are some of the many events and festivals in Shiga in summer 2013 (Web sites are in Japanese). If you want to see the fireworks schedule instead, click here. Lilies galore high up on Mt. Hakodate with views of Lake Biwa in Imazu, Takashima. From JR Omi-Imazu Station (Kosei Line), take a bus to the Hakodate-yama gondola station (15 min.). In winter, the place is a ski ground. The 1,800 yen fare includes the gondola (round trip) fare and admission to the lily garden. Held at Higashi-Omi’s Notogawa Waterwheel and Canoe Land waterfront park (能登川水車とカヌーランド), over 80 dragon boat teams (including women teams) will race on a 300-meter course. If it’s rained out, it will be postponed to July 28. Be sure to also check out the giant waterwheel, symbol of Notogawa. Some 9,000 donated lanterns will festoon this shrine in Tsuchiyama. On the 26th are festival ceremonies and stage entertainment from 6 pm. From Ohmi Railways Kibukawa Station north exit, take the Aikuru bus and get off at Tamura Shrine (about 40-min. ride). Folk dance festival in front of Omi Railways Yokaichi Station. Hundreds of people will dance the Goshu Ondo (江州音頭) which is a bon dance and folk song native to Shiga. First there will be a parade of mascot characters from 7 pm to 7:40 pm, followed by the folk dancers from 7:50 pm to 8:40 pm. Impressive procession of 700 torches following a 2.2 km route from the Shigaraki Chiiki Shimin Center (甲賀市信楽地域市民センター) to the Atago area starting at 7:45 pm. The procession is 50 min. long. Followed by fireworks until 10 pm. 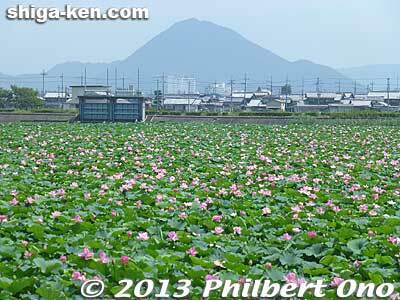 Karasuma Peninsula includes Lake Biwa Museum and a huge lotus field that blooms from mid-July to early Aug. The weekend festival from 7 am to 5 pm is scheduled to have some musical entertainment (taisho koto and yoshibue reed flutes). Buses run from JR Kusatsu Station. Held at Imose-no-Sato (妹背の里), this summer festival is packed with entertainment, games for the kids, candle floating, Goshu Ondo dancing, and fireworks. Taga Taisha Mantosai lantern festival. Held at Taga Taisha Shrine in Taga, the Mantosai or 10,000-Lantern Festival is a beautiful night festival when over 10,000 paper lanterns are lit within the shrine grounds from 7 pm to 9:30 pm. The donated lanterns are for the repose of ancestral spirits. Sarugaku dance by the Taga-za troupe will be performed on the evening of Aug. 4. Other entertainment is also held each day of the weekend festival. B-kyu gourmet is B-rated food (like a B-movie) that is cheap and aimed at the working class. It also includes good ‘ol home cooking. The Hama-Otsu lakefront (near Hama-Otsu Station on the Keihan Line) will have 31 of the most popular food booths from the first (2011) and second (2012) B-kyu festivals. They will serve cheap food (priced from 200 to 500 yen) using homegrown ingredient(s) from Shiga such as Omi-gyu beef, red konyaku (devil’s tongue), and fish from Lake Biwa. 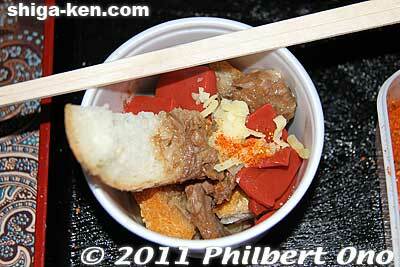 It is a “battle” or contest where the food booths receive popular votes (via disposable chopsticks) from customers. A jazz festival will also be held and fireworks on both nights at 8:50 pm. Note that the food booths require tickets instead of cash. You can buy 1,000-yen ticket books having ten 100 yen tickets. The food festival was held for the first time in July 2011 and turned out to be wildly popular with a total of 120,000 people attending over the two-day period. It was so crowded and many booths ran out of food quickly. Best to go early. I want to go again, but I dread the summer heat, standing in long lines in front of the popular booths. Read my report for event in 2011 here. On this day, you can go on a free or 1,500 yen bus tour to see various Kannon statues at temples in Takatsuki, including the National Treasure 11-face Kannon statue at Doganji temple. You can see statues which normally require an appointment for viewing. If you like sculpture or Buddhist art, don’t miss seeing the National Treasure. The tour starts at Doganji temple, a 5-min. walk from JR Takatsuki Station. Lively festival music and dance parade along Hikone’s main shopping streets centering in Ginza. The street will also be festooned with Tanabata streamers (during Aug. 4-8). 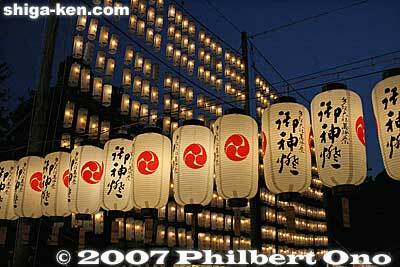 Held for two evenings during the obon season. Participants light their torches at Gosha Shrine and tap the torches on the road as they proceed to Hibarino park where the torches are thrown up to a large pine tree. The more torches get stuck on the tree, the better the next harvest will be. Near Hino Station (Ohmi Railways). 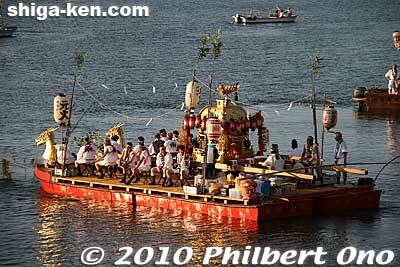 Takebe Taisha boat procession on Seta River. Click to see more images. One of Otsu’s Big Three Festivals, the Senko-sai is a portable shrine procession on boats going down Setagawa River from Seta-no-Karahashi Bridge to Nango sluice and back. 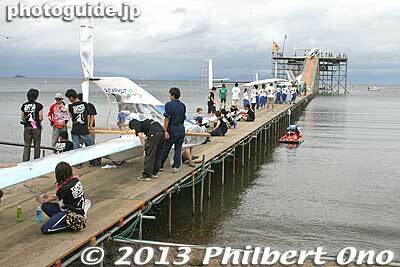 Held annually by Takebe Taisha Shrine (worships legendary warrior Yamato Takeru) near the bridge. The festival starts at 5 pm when the portable shrines leave the shrine, and climaxes with fireworks on Seta River after the boats return at about 8:00 pm. The festival attracts few spectators (unlike the Tenjin Matsuri in Osaka), but large crowds start to gather in the evening for the riverside fireworks starting after the festival boats arrive back at 8 pm. Near JR Ishiyama Station and Karahashi-mae Station on the Keihan Line. Imazu Regatta with Chikubushima in the background. The Imazu Regatta was originally held annually during 1927-36 by the rowing club of the local high school in Imazu (the present Takashima High School). However, the war forced the annual regatta’s cancellation. 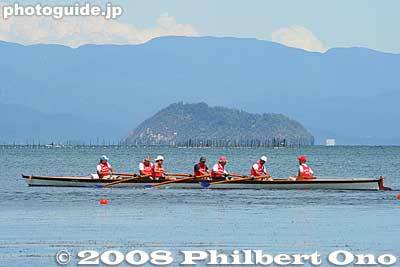 In Aug. 2006, a local NPO called the Takashima-Imazu Rowing Club restarted the Imazu Regatta with the support of the rowing clubs from Imazu Junior High School and Takashima High School. They use a variety of rowing boats (including a replica of a fixed-seat boat from the early 20th century) to race on a 500-meter course. Anyone can sign up to race/row. Beach is near Omi-Imazu Station. More photos here. This evening festival is a good excuse to wear a yukata and stroll along the crystal-clear river. 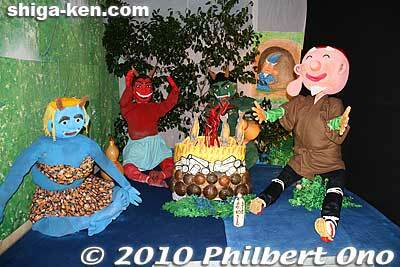 The river is highlighted by a variety of handmade dolls or dioramas created by local school kids. Also see food booths and a local shrine to pray for the deceased. Samegai was a post town on the Nakasendo Road. Near JR Samegai Station in Maibara. During July 20 – Aug. 4, 2013, the tiny baikamo flowers (miniature plum blossoms) in the river will be lit up in the evening during 7:30 pm – 8:30 pm. The festivities start at noon climaxing at 8:30 pm with the lighting of numerous reed torches dotting the grassy highland area and ending with fireworks. The festival event schedule is yet to be determined as of this writing. From JR Makino Station (Kosei Line), take the “town bus” and get off at Makino Kogen Onsen Sarasa (マキノ高原温泉さらさ). Buses leave Makino Station once an hour until 6 pm (schedule here). Benches are provided in the lit-up garden to listen to insect chirping accompanying classical Japanese music or reed flutes. One friend told me that he enjoyed it more than expected. Garden admission charged. Near Hikone Station. Also see the 2013 summer fireworks schedule here. Looks like we’re in for a very hot and humid summer. Right after the rainy season ended earlier than usual (though it did start earlier than usual), bam, we got hit with a heatwave. The people most vulnerable to heat illness, heat exhaustion, or heat stroke (all called netchusho 熱中症) are those who have never experienced it. The scary thing about heat illnesses is that it can come on very suddenly with no warning. One minute you’re feeling okay, and the next minute you feel like passing out on the spot. It’s a really scary feeling when you feel like you are losing consciousness because it seems like you’re gonna die. It’s different from falling asleep. It’s like your power switch is being switched off. Your nervous system shuts down. When it occurs to you, it’s hard to tell if it’s serious or not. If the victim is unable to talk back to you, it might be serious and an ambulance needs to be called. People can and do literally drop dead from heatstroke (called nesshabyo 熱射病). If you see someone suffering from heat illness, lay the person down in the shade or air-conditioned room, elevate the legs to facilitate blood flow to the head. Place something cool (like a bottle of water) on the neck, underarm, or loin area. Give water while making sure the person doesn’t choke. Fan the person too. Even a minor bout (not life threatening) of heat illness (sometimes called natsubate 夏ばて) can be quite debilitating and can take you weeks to recover. It can also lead to other ailments like dizziness, a feeling of being in a constant daze, or prolonged lightheadedness. When you perspire, better not to keep wiping it off. Letting your perspiration evaporate will cool the body. Of course, one problem is that the humidity can be so high that your perspiration is unable to evaporate. That’s when you should seek refuge in an air-conditioned place. Another wise thing to do is to take a dark umbrella for shade and an ice pack/towel for your neck. It really helps. Stay cool y’all in Japan.